Hi there! We've just made Edicy a much better marketing tool. 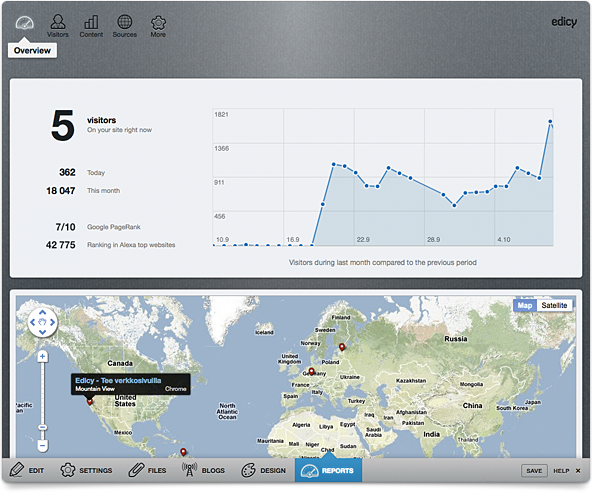 Starting today, all paid accounts have a full blown LIVE statistics engine. It breaks down sources of traffic. It shows which content gets how many eyeballs. And it allows you to see visits as they happen, live on the map. Not a Pro user yet? Upgrade now! Oh and one more thing. This week only, all Edicy users can get a full year of Oh and one more thing. This week only, all Edicy users can get a full year of Pipedrive at a 75% discount. Pipedrive is a CRM-replacing deal management tool that is built for active deal makers, not only salespeople.